All love begins with motherhood. 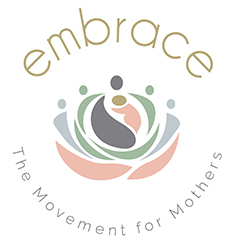 Embrace is a national movement that promotes a connected and thriving start to motherhood for every new mother in South Africa. Its vision is based on the understanding that an empowered and embraced mother raises a thriving child. To this end, the movement aims to create a powerful network of mothers who support and advocate for each other and who feel valued, confident and positive about raising their children. Embrace has also made it its mission to tackle some of the structural and social dynamics that shape the experience of early motherhood. Vuyokazi Kana, a mother from Duncan Village, near to East London in the Eastern Cape cuddles her daughter (2018). Read more: For a succinct overview of the ‘Why the first 1 000 days’ argument for early learning, read this article by George Halvorson, entitled Not teaching parents about early brain development is a massive and damaging public health failure. The transition into parenthood is a vulnerable time for women. Between 9% and 21% of new mothers experience depression during pregnancy or after the birth of their baby, and it has been shown that a mother’s mental health can negatively affect the development of her childMcLeish, J. & Redshaw, M. 2017. Mothers’ accounts of the impact on emotional wellbeing of organised peer support in pregnancy and early parenthood: a qualitative study. BMC Pregnancy and Childbirth, 17:28. Access here.. Support from others can help to lower feelings of depression and anxiety in a new mom by boosting her sense of self-esteem and competence as a parent, and by making her feel less isolatedIbid.. Such support has also been shown to reduce preterm birthsIckovics, J. R., Kershaw, T.S., Westdahl, C., Magriples, U. Massey, Z., Reynolds, H. & Rising, S. S. 2007. Group Prenatal Care and Perinatal Outcomes: A randomized trial. Obstet Gynecol, 110(2 PT 1): 333-339. Access here. , and to increase the length of time women breastfeed, as well as the length of time they breastfeed without introducing any other types of liquids or foodsRenfrew, M. J., McCormick, F.M., Wade, A., Quinn, B., & Dowswell, T. 2012. Support for Breastfeeding mothers. Access here.. Given that in South Africa, 27% of children under five years of age are nutritionally stuntedSaid-Mohamed, R., Micklesfield, L., Pettifor, J., & Norris, S. 2015. Has the prevalence of stunting in South African children changed in 40 years? A systematic review. BMC Public Health 15(1):1-10., supporting new mothers is an important strategy to strengthen human capital development in the country. To reduce the vulnerability of small children, more than just services and programmes are required – a societal response is needed. Once mothers and babies leave their post-natal clinic checks at six weeks of age, they only visit health services for vaccinations or when they or their babies are sick. It’s therefore vital that mothers are acknowledged and supported in their roles as the number-one champion for their children during their early formative years. Everyday interactions with a caring adult are also vital for developing resilience in children. As American psychologist Ann Masten has pointed out, resilience does not come from rare and special qualities, but from the everyday magic of ordinary, normative human resources in the minds, brains, and bodies of children, in their families and relationships, and in their communities.”Masten, S. 2001. Ordinary Magic: Resilience Processes in Development. American Psychologist Vol 56, No.3. Available here. It grows from being loved. It is for this reason that Embrace has adopted a people-driven approach to supporting mothers as the primary ‘simple, loving connection’ in their children’s life. Irrespective of their backgrounds, all mothers have the power to lay the foundations that will powerfully impact the potential of her children to succeed in life. Ageelah Titus kisses her son during a visit to the Philani clinic in Blikkiesdorp – also known as the Symphony Way Temporary Relocation Area – in Delft, Cape Town (2018). Embrace’s strategy is focused on tapping into the thousands of shared experiences around motherhood – and allowing these to drive a movement through which mothers experience societal, collective, and interpersonal support. The knowledge and ability to advocate for her child. While Embrace hopes to reduce child vulnerability, it firmly believes that – first and foremost – motherhood needs to be supported for the sake of it. It also hopes to elevate the social status of motherhood to one that all South African mothers can connect to. When mothers believe that the identity of motherhood is shared – no matter how different people are – it allows for honest sharing of good and bad experiences that draw people together in a safe space, where deep listening can take place and empathy is cultivated. There are many good practices of motherhood, but no single way to mother our children. We acknowledge and value the role of culture and beliefs in the way they shape our motherhood journey. We have the right to celebrate our children and honour our role as mothers of the next generation. The movement works on the premise that empathy drives action, and so Embrace provides a number of ways for mothers to put their empathy to work. For example, Mother’s Day Connect – one of the movement’s flagship events – was born from the simple idea of mothers visiting new mothers at hospitals, calling on them to remember their own experiences of what it felt like to be a new mom. The Hub also works with local champions in communities to rally around issues that affect mothers from a broad range of backgrounds in order to provoke conversation and/or action. For example, the mobilisation of a group of mothers to stage a public ‘nurse-in’ to protest against the unfair public discrimination of a nursing mother from Mitchell’s Plain in 2016, brought together a diverse group of mothers passionate about protecting their breastfeeding rights. More than 300 people signed up to join Embrace through this initiative. Participation in the movement is not confined to face-to-face encounters, however. In its effort to build a powerful brand focused on mothers, and which builds a sense of identity and belonging within the network, Embrace uses digital media to connect mothers and share a range of voices and experiences across motherhood. Through its innovative pilot, the Virtual Mothers Book Club, launched in 2017, Embrace has shown it is possible for meaningful and supportive relationships to form between mothers who may not have the opportunity or resources to meet in physical spaces. Embrace also seeks ways of communicating with policy-makers to tackle some of the structural and social dynamics that shape the experience of motherhood in the first 1 000 days. The Embrace hub team seeks to build relationships with individuals and organisations – NPOs, government, the corporate sector, faith-based organisations and tertiary institutions – that work to serve new mothers in its effort to set the Motherhood agenda in South Africa. Finally, Embrace is in the process of learning how to create network action groups around motherhood. This involves a storytelling process that has become increasingly important to the campaign. It brings the good and bad moments of motherhood (sometimes never shared before) to light, and helps women to develop the courage to start addressing the issues for themselves and for a community of mothers. Embrace also runs communication campaigns, sharing the stories of willing mothers to build solidarity with the movement, for example, the #IamMother campaign that launched in 2018. Adoptable – by mothers and Embrace groups in different settings. Adaptable – to the different cultures, religions, and contexts of mothers in different parts of the country. Scalable – simple enough in their design to be taken up easily by groups across the country. Read more: Telling the stories of motherhood in South Africa, by Rumbi Goredema Görgens, Embrace Operations Manager, published by DGMT in 2018. When Embrace was initiated in 2013, its focus was on protecting and developing the potential of the 75 000 babies born in Cape Town each year by creating one-to-one connections between individuals. This model of connection building proved labour intensive and too rigid to encourage the natural ripples needed to spark a successful movement that could be taken to scale. So, based on learnings and critical evaluation of an idea and strategy that has largely not been tackled before in South Africa – i.e. to facilitate and enable relational connections between mothers across social divides in the interest of their young children – Embrace started the journey towards a major strategic shift in 2016. By 2017 it decided to leave behind the one-to-one connection model to rather try and find creative ways of mobilising and engaging directly with mothers in cities across the country. In 2018 Embrace rebranded and launched its new mission to inspire, mobilise and connect mothers across SA. Mother’s Day Connect is a prime example of Embrace’s strategy of turning moments of mobilisation into opportunities for sustained engagement and interpersonal connection. A simple and spontaneous idea initially meant to visit new mothers at Karl Bremer Hospital on Mother’s Day quickly grew to 100 women visiting 490 new mothers at 12 Cape Town hospitals in 2016, and approximately 450 women visiting 1 500 new mothers in six cities in South Africa in 2017. Mother’s Day Connect 2018 exceeded all expectations, expanding from four to eight provinces and adding 12 new cities to its reach. Approximately 3 000 new moms were visited, with women sharing stories of continued support and innovative ideas across the network long after Mother’s Day ended. To date, Embrace has relied on digital, social and mainstream media to convey key messaging and engagement opportunities. For example, in 2018 it ran a national storytelling campaign that resulted in the production of high-quality audio-visual content showcasing the diversity of South African mothers’ experience. Moving forward Embrace aims to communicate more intentionally at the community level, with targeted messages in as many media outlets as possible, as well as more frequently with mothers. In 2018 the campaign launched ‘“Tuesday Check-in’s” where mothers in the network get an encouraging email and WhatsApp message to pass on to another mother in her personal network that she chooses to support. The idea is to encourage women to be intentional in encouraging other mothers in their lives. In terms of informing policy, Embrace is starting to make inroads, too – already serving as an influential member of the Parental Infant and Child Health committee in the Western Cape, helping to inform its work on shaping human-centred service delivery. In 2018, it participated in the South African Civil Society for Women’s Adolescents’ and Children’s Health (SACSOWACH) roundtable on breastfeeding in the workplace. Read more: Connecting South Africans around motherhood: Three strategic insights that have shaped the mission of Embrace. A DGMT Learning Brief, published in 2018. 1. ⇧ Cusick, S and Georgieff, MK. The first 1 000 days of life: The brain’s window of opportunity. Unicef: Office of Research: Innocenti. Access here. 3. ⇧ McLeish, J. & Redshaw, M. 2017. Mothers’ accounts of the impact on emotional wellbeing of organised peer support in pregnancy and early parenthood: a qualitative study. BMC Pregnancy and Childbirth, 17:28. Access here. 5. ⇧ Ickovics, J. R., Kershaw, T.S., Westdahl, C., Magriples, U. Massey, Z., Reynolds, H. & Rising, S. S. 2007. Group Prenatal Care and Perinatal Outcomes: A randomized trial. Obstet Gynecol, 110(2 PT 1): 333-339. Access here. 6. ⇧ Renfrew, M. J., McCormick, F.M., Wade, A., Quinn, B., & Dowswell, T. 2012. Support for Breastfeeding mothers. Access here. 7. ⇧ Said-Mohamed, R., Micklesfield, L., Pettifor, J., & Norris, S. 2015. Has the prevalence of stunting in South African children changed in 40 years? A systematic review. BMC Public Health 15(1):1-10. 8. ⇧ Masten, S. 2001. Ordinary Magic: Resilience Processes in Development. American Psychologist Vol 56, No.3. Available here. 9. ⇧ Social capital includes everything that people share through networks to add advantage to others, such as information, mobility, time, money and useful items, expertise, experience, skills, acceptance, support, etc.